Our Fourth of July parties are completed, and I am diving into our Summertime Pantry Challenge, where my goal is to eat from our fridge, freezer and pantry for the month, and share some additional ways to save money on food. I am going to clear out some of the food items that have been lingering for awhile, get creative in the eating produce department since my garden is busting at the seems, and limit spending drastically for the month. In fact, for the next ten days, I will probably not even step foot in a grocery store. Yes, I think that will be possible since I have so much produce on hand (but I am may need some fruit). I think you could do it too – maybe just for a few days? It continually amazes me when my children open our fully stocked fridge and freezer, and claim there is no food in the house. With that being the case, they are about to find out what it means to get creative with our food and really use up what we purchase. One of the benefits of stockpiling is that we have our own “mini store” on hand (which is the goal). Rarely, do I come across a recipe and panic because I am out of half of the ingredients. I typically have 3-4 extras of things we use often, but with that stock pile comes a few downsides. It seems ironic that with extra food can come waste, but periodically, our kids are more wasteful the more I have on hand. For instance, we make taco dip, served with tortilla chips, continuously for snacks. As I type, we have three different bags of tortilla chips open. Really? Three? Could they not have looked just a bit closer before opening another one. 😉 Not to mention the two ketch-ups and three jams open as well. A year and a half ago, I went on a very significant Pantry Challenge, and ended up only spending around $100 for the entire month, for our family of seven. By the end of the month, it was tricky, but the challenge was so worthwhile. I had the whole family on board, including my husband, which is crucial, and we got incredibly creative. We were in the middle of our year of unemployment, so the significant cash saved made a huge dent in our very tiny budget. Now, our food budget is not the issue. (Wow, I really can say that with no stress.) We have the ability to choose NOT do this. I have the ability to choose NOT to coupon or be frugal in the food department, yet that choice over many years, would be disastrous. My desire is to model for our children that saving money in every aspect of our lives, over a long period of time, is really the difference between living financially free and continually being strapped. Now, please hear me. There were periods where we were living frugally, and still incredibly strapped for cash, but I am talking over a life time here. 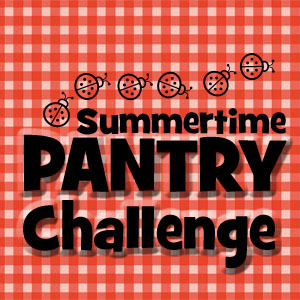 Right now, some of my guys will question this pantry challenge month, and debate the fact that we have money to shop, so why decide on this challenge. But this challenge is going a bit deeper than just being good stewards of the food that I already have. It’s about teaching my children a bigger life lesson. We are heading to Guatemala in the next month, and I want them to realize that our “nothing to eat” is a continual bounty, and if worse came to worse, we could survive for a long period of time on what we have right in our home. My goal is to update on our pantry challenge a few times a week throughout the month, and I would love for you to join me. I have an entire category titled, Saving money without Coupons. These posts share ways to save money on food without having to cut coupons. Even though, pairing coupons with sales is ideal, hopefully this category will open up your eyes to a variety of money saving ways, and a food challenge is one of them. I’ll be updating through out the month, and would love to hear what you’re doing as well. We can encourage each other along this road and see where we end up. It could be interesting. Some of my friends are challenging themselves as well. It’s always inspirational to see how people tackle this challenge in different ways. Not all of them are limiting their spending, but the nature of the challenge, makes that happen anyhow, and I love to think of all the ways we can put that saved money to work for us. So join me and get creative for the month. You’ll be so glad you did! 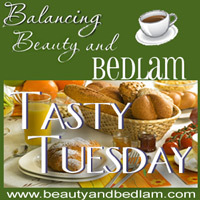 Now let’s see what you all are cooking up for Tasty Tuesday. I’m joining in the challenge. My garden is starting to rock! I am so IN the challenge!! I will post later today but I can’t wait to see what I can do to save a little green in my house. The budget needs a little tweeking!! Thanks for hosting and inspiring me to be more frugal!! I’m doing this as well. I know that I will need to purchase a few things here and there but I don’t plan to do actual shopping trips but just purchase what we need. We have lots of rice and a freezer full of meat/veggies. I make our bread (most of the time, I slacked off recently but have some dough rising right now) so I think we will be good. I just need to get back on track. I haven’t been great about sticking to our grocery budget lately and I think this will be a nice way to reset my system. LOL Good luck everyone!! Great encouragement! I may not have my stockpile where it needs to be to do this for a full month or even a couple of weeks, but with just two of us and quite a bit of food in the house, I can at least think more creatively day-by-day to use what I already have rather than shopping! I’m joining in… we are stockpiled and ready. I need to clean out my freezer and pantry so I at least know what I have!! My husband and I are soon going to be empty nesters so we are challenging ourselves to come up with new menus for two adults rather than a ravenous teenager!! Ought to be interesting…. Thanks for hosting this link up. I love browsing through the links each week. I don’t have a link up, but we’ve been very busing canning tomatoes, grape jelly, plum jam and salsa. Our pantry really needs a good overhaul and is on the to do list for today. We’ll be eating from the pantry and freezer this month also. I can’t wait see what goodies everyone comes up with. I’m using this challenge to remind myself to use up food before it spoils, or to buy small quantities (a must in a small household!). In our house, it’s too easy to buy something and simply not be able to eat it all before it spoils. 1. I just cleaned out my pantry and freezer yesterday. 2. The recipe I linked up (Lentil Quinoa Salad) was made because I’ve had a bag of lentils in my pantry for MONTHS with no idea how to cook them. Love cleaning out the pantry! A big “yes” to the pantry challenge… my freezers are so packed that I can’t fit one more thing in there. It a good thing, but also time to start using what we have and not buying more. Oh, and I’m reading this on Chrome as a browser, and the text for your links are not visible, though they are clickable. Thought you might want to know. I love this idea! I am not doing a big official challenge, but this month I am really trying to limit what I throw out. I’m bummed because I already had to throw out a failed recipe I tried (used all of my potatos too), but so far so good on the produce. I want to keep a list of what all I’ve thrown out for the month and see how much I am wasting. Thanks, as always, for the inspiration! I agree, not in for an official challenge but definitely with you on the conundrum of children (and a hubby) opening the fridge and declaring it empty of worthy foods. 🙁 Oy! It’s enough to drive me nuts! We are wasting a lot of food as summer hits full-speed here: lots of dinners going to waste as we hit the drive-through or put plans off one more day just to see that ingredients have gone bad waiting. So, I’m going to try and use some of my blog-found tips to limit these problems! I really need to join in this! There is so much food here that sometimes just goes to waste and there is no reason why it can’t be eaten! I just got the last paycheck from my substitute teaching job and will not see another one until around Nov. 1st (our paychecks are delayed for a month after you finish working the previous month). I have a stocked pantry and freezer and the garden is starting to produce all the lettuce we can handle plus more and I am anxiously awaiting the cherries and raspberries ripening along with the tomatoes setting fruit and the squash producing. I make most of our bread also and will just need to get more flour within the next few months (I don’t like to store too much when it is this hot since we prefer whole wheat flour). I am hoping to stay at about $100-$150 total (including our dog’s food that runs us about $59 a month along with cat food and kitty litter) each month.